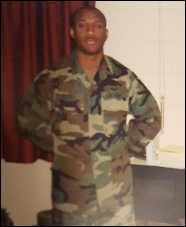 U.S. Army Staff Sergeant David Walker enlisted in the military in 1990 out of Fort Myers, Florida because he wanted to discover himself while serving his country. Sergeant Walker was on a routine morning patrol in June of 2006 when his vehicle was ambushed by grenade fire. The fatal explosion severely injured Sergeant Walker. His injuries resulted in the amputation of his left arm, burns on his right forearm, facial numbness, tinnitus and lower back pain. For his service to his country, Staff Sergeant Walker was awarded the Purple Heart, Army Achievement Medal (2x), USA/USAF Presidential Unit Citation, Army Good Conduct Medal (3x), National Defense Service Medal (2x), Iraq Campaign Medal, Global War On Terrorism Expeditionary Medal, Global War On Terrorism Service Medal, Korea Defense Service Medal, Army Ser-vice Ribbon, Overseas Service Ribbon, Combat Infantryman Badge, Marksmanship Rifle (Expert), Marksmanship Grenade (Sharpshooter) and Air Assault Badge. Staff Sergeant Walker, his wife, Shoniquantia, and their three children were gifted a home in Lehigh Acres, Florida in 2016.